On Sunday, I made quimbolitos for a dinner party. Quimbolitos are one of my all-time favorite Ecuadorian delicacies, a rich (eggs, cheese, lard), not-too-sweet cornflour cake steamed in achira leaves. Getting the flavor right brings an instant memory burst of family adventures (and misadventures), close friends, afternoon sunlight, possibility. . . all worth, to me, a bit of kitchen struggle, a little on-the-fly translation and adaptation. What are quimbolitos? 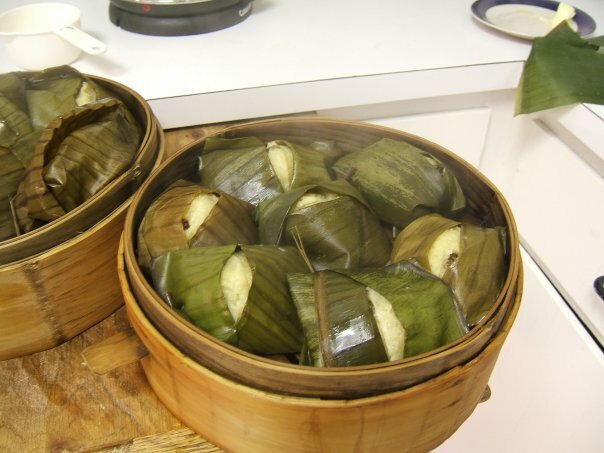 One cookbook I have describes them as "sweet tamales," which seems accurate, as far as it goes--it conveys the idea of a leaf-wrapped, steamed cake--but I have always considered them completely different, possibly because of the way I learned the names. I learned the names as I learned the foods, and as I learned Spanish. Tamales, quimbolitos, humitas are not eaten on the same occasions in Ecuador, they're not necessarily made at the same time of year, they're not interchangeable. But as anyone who's traveled knows, food vocabulary isn't interchangeable, even within the same language. On my first trip to Spain (after living in Ecuador, after graduate school, after several years of teaching) I was often mystified by half the items on a menu. My saving grace was that I spoke the language well enough to ask for explanations. Ecuador used to be further away. When I first lived in there, no one in town had a private phone. To make a call, you went to the central office; if you had a call, they sent someone to find you at home. Now there's Wi-Fi in the plaza. When we first returned to the U.S., I took it for granted that certain things would be inaccessible. I didn't expect to find particular foods, ingredients, songs. My mother told the story of her ill-fated attempt, returning from Ecuador in the early sixties, to make quimbolitos for her father, using plastic wrap (or was it wax paper?) in place of the required leaves. So much for that. I didn't try quimbolitos myself until two years ago. Things have changed. Elizabeth Lambert Ortiz's Latin American cookbook, first published in 1969 and reprinted through the seventies (perhaps beyond) gives mail-order sources for specialty ingredients; she suggests parchment or foil for steaming. Maria Baez Kijac's The South American Table (2003) informed me that banana leaves, a possible substitute for achira, are available frozen. Conditioned early to a degree of resignation--you can't get that here--I would never have thought to look. But we have an excellent Latino/a grocery close by and, sure enough, they carry the leaves. And the lard, the right kind of cheese (a little saltier, maybe, but close enough). Feeling sentimental, I even bought Mexican sugar weekend, because it looked like I what I remembered. I don't own a tamalera, but my husband's bamboo steamer worked fine. Of course, it's not just the taste I'm after. We have a friend, a wonderful woman who welcomes me every time I arrive as if there were no one in the world she'd rather see. She always makes me quimbolitos, and she always lets me help, rather than sending me out of the kitchen like some kind of guest. I have three different recipes in my cookbook library, but the one I use is the one in Spanish that most resembles the way I remember making them, modified a bit according to her advice. That's the recipe I translated for my dinner party friends. This weekend was only my second run at quimbolitos. They're really not that difficult, but the folding and wrapping is time-consuming. My daughter helps me, though. She remembers making them when I took her to Ecuador a few years ago. And the taste really is the one I remember, even with my little tweaks and substitutions to get out of buying a whole bottle of anisado. I do feel some sense of loss in this compression of distance. What was once special or reserved is now easily obtainable. But I welcome the chance to knit my children more fully into this piece of my experience. And I'm still working on a few modifications. On my last trip to Ecuador, I bought several plant books, needing to learn more names for a translation I was working on. I found out that achira is a kind of canna. Well, cannas seem to run rampant in Oregon. Maybe even I could grow them. What I haven't found out yet is if all cannas are equally edible, so for the time being, I'll use those banana leaves in my grocer's freezer. I did promise my daughter it wouldn't be another two years before we made them again, so it's time to speed up my investigations. Your observation that the shrinking of the world is bittersweet is exactly right. It's how I also feel when I eat produce out of season, shipped in from South America. I'm glad to be getting asparagus in January, but I also regret losing the thrill that comes from waiting until spring. I just have one complaint: How could you describe quimbolitos so deliciously without also including a recipe? Recipe follows. Note that it calls for pork lard, which some may want or need to omit. I think you can use only butter instead. It won't have exactly the same flavor, but it will be yummy. Mix butter and lard until soft, gradually add sugar and beat until well creamed and fluffy. At eggs one at a time, beating well between each one. Add cheese, lemon zest, extracts and rum and mix well. Add cornmeal and baking powder. When well missed, stir in the raisins. Place approx. 3 T. batter on a banana leaf (more or less depending on size of leaves), folding first the sides--leaving a small gap so the cake can rise--then tucking the ends underneath. Steam in a tamale pot or bamboo steamer for 30 min. Serve warm or cold. Notes: traditionally, 2 T. anise liquor in place of the extracts and rum above. In Ecuador, these are steamed in achira leaves, but banana leaves, available frozen, are a good substitute. Use a 1lb. package for this recipe. Thaw in fridge over night, cut to roughly 8 in. widths, rinse and dry. Those sound delicious -- even the lard! We used to buy tamales pre made, wrapped in corn husks, when I was growing up. One year, we tried making them and I couldn't believe how labor-intensive they were. Now, I'm lazy: I make tamale pies. If I'm ever feeling adventurous, I'll make these. We've got a bamboo steamer for making dim sum (which I've managed to use five times in the 20 years we've owned it). I wonder if Monterey jack would work for the cheese? I think they use cannas to make a kind of noodle in Southeast Asia -- I'm not positive, but if it's not them, it's something that looks like them. Cannas are also good for absorbing pollutants in the soil -- (which would make me a little leery about eating them!). Tamale folding of any variety is definitely a project to be undertaken in company! I don't think I'd use Monterey Jack--a very mild, not-too-moist ricotta might be closer in texture. I didn't know about cannas' absorption prowess--does give one pause. Then again, given what (little) I know of banana farming, there's no reason to think the banana leaves in my grocer's freezer are pollutant free.